Dusty wishes for a fast Remote Control Truck to race in the house during cold weather and have fun! It's tough being a boy bound up inside during cold weather and he wishes for a fun activity he can do in the house. Dusty is a charming young man who likes to have fun with his friends and please others. He loves to play in the creek and have fun with his younger brother. He tries hard in school, but has some difficulties at times. He is funny, lovable, and a good friend to others. Dusty just needs someone to give him a chance and help him see the bright future he has. Foster Parent Association of Wilkes requests this wish for Dusty. Wendy grants the wish for Dusty! Thanks Wendy. One Simple Wish sends the gift to the Foster Parent Association of Wilkes for Dusty. Dusty receives the gift from Foster Parent Association of Wilkes! "Dusty was super excited to receive the new remote control truck! When I delivered it his mouth flew open and you could see the amazement and joy all over him! He said it will go 30 mph! He can’t wait till Saturday till he can get to a big open place to operate it! Thank you for caring!!" Nikki sent an update on the wish for Dusty. 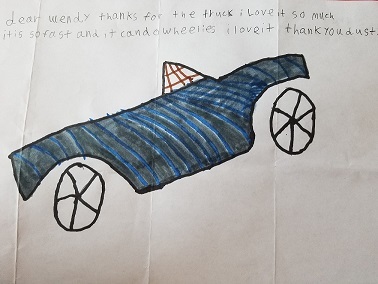 "Check out the amazing Thank You Note Dusty wrote! It is so awesome!" Want to Help Children Like Dusty?